We are very happy to announce that the recipient of the 2018 SSA Backbone Award is Sonia Pressman Fuentes. Sonia was born in 1928 in Berlin, Germany, of Polish parents. She and her family immigrated, first to Belgium, and then to the United States in order to escape the Holocaust. 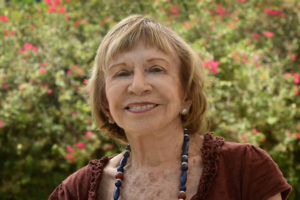 After graduating from University of Miami School of Law, she was the first woman attorney in the Office of the General Counsel at the Equal Employment Opportunity Commission (EEOC) and one of the founders of the National Organization for Women (NOW). Sonia is the author of the memoir, Eat First—You Don’t Know What They’ll Give You, and dozens of articles which have been published in major newspapers, magazines, and journals around the world. Sonia will receive the Backbone Award at the 2018 SSA national conference this summer. Patricia Ireland, former president of NOW, will join us in honoring Sonia at the awards presentation. Each year, the Backbone Award is given to a secular person whose dedication and work over many years has been foundational in the cause of civil rights, freedom, and equality.